As far as crabs go, the European green crab might not look like much. They're small -- only about 4 inches wide -- and lack the giant claws of fiddler crabs or spindly limbs of king crabs. But don’t be fooled. 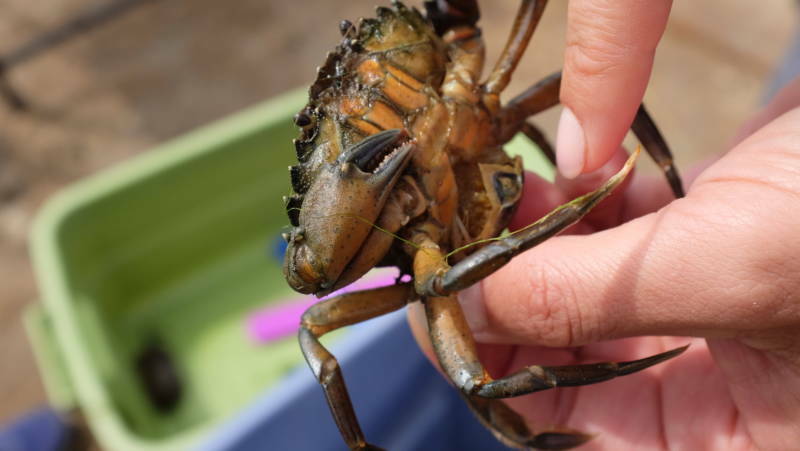 Green crabs are voracious predators that rank among the world’s worst invasive species. Scientists estimate green crabs cost the fishing industry close to $19 million annually on the East Coast alone. And in recent years, they have been spotted along the West Coast from Monterey Bay to British Columbia. A consortium of California ecologists, dubbed the Green Crab Project, is striking back. 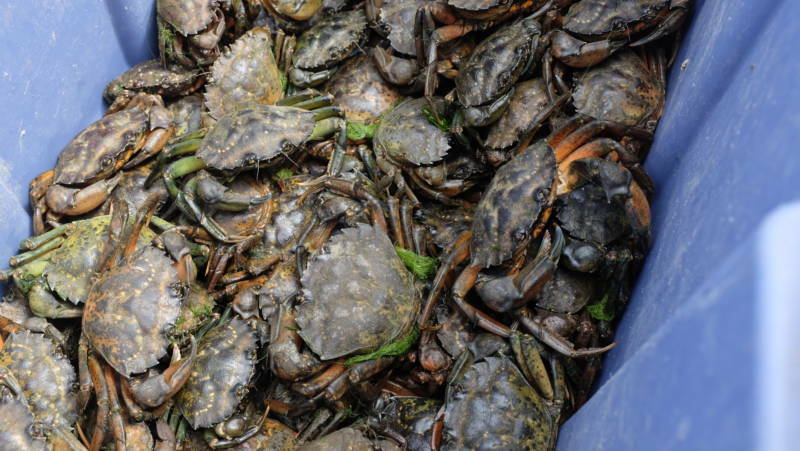 The team has been removing thousands of European green crabs from a small inlet north of San Francisco called Seadrift Lagoon. This sleepy Marin County vacation spot holds the highest concentration of the invasive species on the West Coast. When the Green Crab Project launched in 2009, the crabs' population in Seadrift approached 90,000. “People around here tell stories about how they would walk into the lagoon or start swimming in the lagoon, and the crabs would be crawling over their feet and legs,” said Kate Bimrose, who coordinates the project for the Greater Farallones Association. Bimrose and her colleagues make weekly trips to Seadrift each summer, hauling out hundreds of crabs a day from traps off single-seat kayaks. 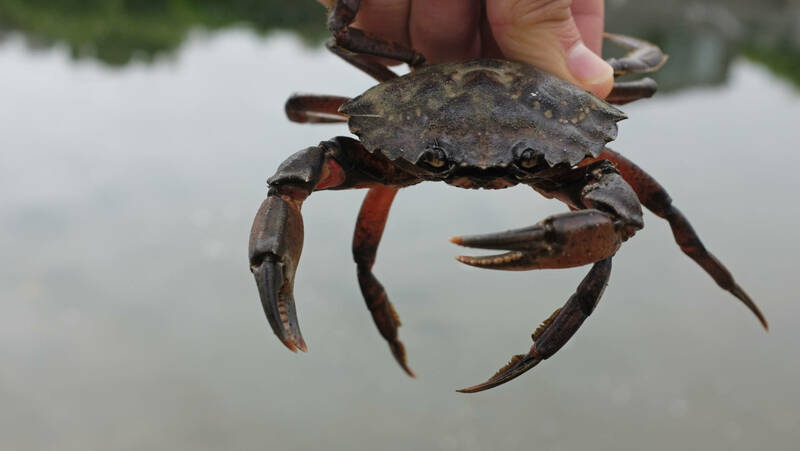 Bimrose says green crabs pose a serious threat to commercial fisheries in the region because they decimate populations of native clams, mussels and other crabs. The ripple effects threaten the entire coastal food web, from Dungeness crab to large fish and shorebirds. The ecological and economic fallout has yet to reach the levels observed on the East Coast. But scientists like Ted Grosholz, whose lab at UC Davis is a major contributor to the Green Crab Project, believes it may only be a matter of time. Green crabs were first observed on the West Coast in San Francisco Bay in 1989. Researchers think they hitchhiked here in boxes of live fishing bait shipped from the East Coast. Once established, the crabs can spread to other bays in the ballast waters of ships or on currents in the larval state. And because Seadrift exchanges water with the adjacent Bolinas Lagoon -- which connects to a larger system of currents -- the crabs here have potential to fuel a much larger population boom. Grosholz says the removal efforts in Seadrift have been a proving ground for how to best control invasive species. In 2014, after the team had removed most of the larger adult crabs from the lagoon, they saw the population skyrocket to over 300,000. It turns outs the adults cannibalize baby green crabs, keeping the population in check. Grosholz's findings help support an environmental theory known as overcompensation. The idea posits that controlling an invasive species can backfire unless it's possible to remove every individual at once. The team now leaves a number of adult crabs in the lagoon so the population can, in part, manage itself. Grosholz says introducing other predatory species like leopard sharks could also help. The population of green crabs in Seadrift has now dropped below 40,000. That's a much more manageable number, according to Grosholz -- though he admits there is still an element of “wait and worry” when it comes to the fate of the West Coast green crab invasion. After years of trial and error, Bimrose says they have begun to see the return of other species to Seadrift Lagoon. "When we first started this project, there weren’t much in the way of other species. Pretty much everything you got was all green crabs," she said. This summer, the team started seeing a small number of shrimp and fish, and even a handful of other crabs. So what happens to the thousands of green crabs pulled from Seadrift each year? So far, their best use is as fertilizer. "We have been told by the farm owners that the green crabs make for great crop fertilizer due to the large amounts of calcium in their exoskeleton combined with nitrogen in the tissue," said the Smithsonian Environmental Research Center (SERC), which has a lab in Marin and participates in the Green Crab Project. "We like to call it a fully surf-to-turf project," Bimrose said.